Tony Robbins is an American Self-help author and success coach. Robbins’ books include “Unlimited Power: The New Science of Personal Achievement and Awaken The Giant Within”. 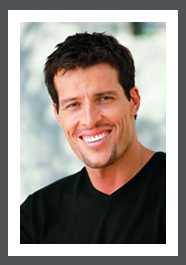 Tony Robbins began his career promoting seminars for Jim Rohn. According to Tony Robbins, Jim Rohn taught him that “happiness and success in life are not the result of what we have, but rather of how we live. What we do with the things we have makes the biggest difference in the quality of life”. Later Tony Robbins began teaching Neuro-Linguistic Programming (NLP) after training with NLP co-founder John Grinder. In 1983, Robbins learned firewalk from Tolly Burkan and began to incorporate it into his seminars. Tony Robbins also teaches Neuro-Associative Conditioning (NAC)and Ericksonian hypnosis. Tony Robbins promotes his “peak performance coach” services and products through books and infomercials. For the past three decades, Tony Robbins has served as an advisor to leaders around the world. A recognized authority on the psychology of leadership, negotiations, organizational turnaround, and peak performance, he has been honored consistently for his strategic intellect and humanitarian endeavours. His nonprofit Tony Robbins Foundation provides assistance to inner-city youth, senior citizens, and the homeless, and feeds more than three million people in 56 countries every year through its international holiday “Basket Brigade.” Robbins has directly impacted the lives of more than 50 million people from over 100 countries with his best-selling books, multimedia and health products, public speaking engagements, and live events. What began as a young person’s desire to help individuals transform the quality of their lives has grown into Robbins’ lifelong crusade as he is called on by leaders from every walk of life-presidents, political leaders, advocates for humanity, CEOs of multinational corporations, psychologists, peak performance athletes, world-class entertainers, teachers, and parents. Since fathering the life coaching industry, Tony Robbins has produced the #1-selling audio coaching system of all time.